"In March of 2015 we had a house fire and lost everything. We had no idea where to begin rebuilding our life. Ware Design Build met with us, gathered our ideas and had a set of house plans designed exactly as we had envisioned. This was our first time building and we had no idea all the details that go into a new home design and build. The most impressive part of our build was the ease of the process and the patience of the staff. Everyone was so helpful with selections and answering all of our questions. Everything went so smooth. We were so pleased with the professional service provided by Ware’s staff and the quality subcontractors that were part of their team. We also were thrilled that we were able to stay within our budget and still include everything we wanted in our home. In less than 4 months we were moved in and enjoying our new home. Our expectations were not only met, they were exceeded every step of the way. We are grateful that we choose Ware Design Build to build our home." "In late 2012, we purchased a 1 year old existing home built by Ware Design Build. It’s just beautiful, so when we decided to finish our lower level, we immediately thought of Ware. Our goal was to have this new space a continuation of the rest of the house, with the same excellent quality, craftsmanship and style. Ware Design Build did not disappoint. 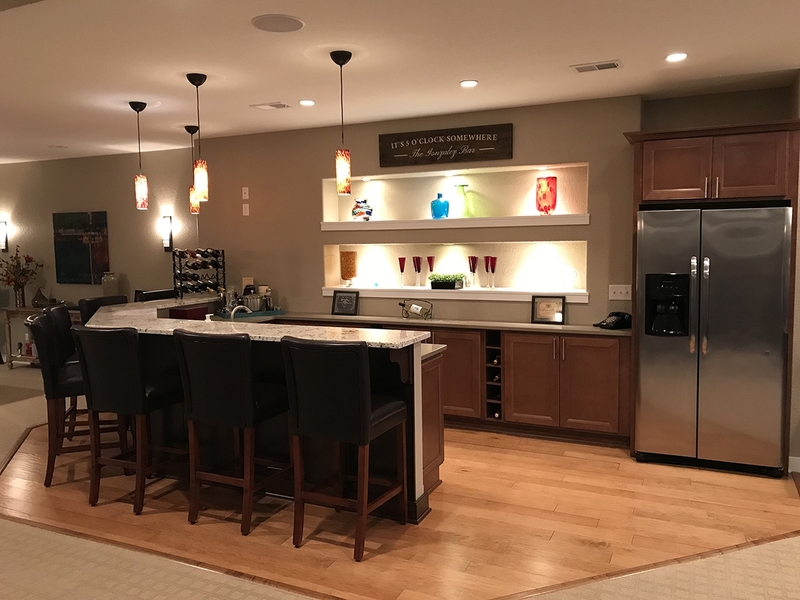 Our lower living area is just what we envisioned – a media center, dining, large bar with granite, a game area, an exercise room, a bedroom with a walk-in closet and a full bath. They even worked in a good sized storage room. We were most impressed when we showed the Ware Team a magazine photo of a full wall built-in lighted shelf unit behind the bar and they jumped at the challenge. The custom wall they created is the highlight of our room. We couldn’t be more thrilled." "Tony and I wanted to take a moment to thank you for the wonderful building experience! From the time that we decided to build with Ware Design Build we received amazing service, attention and lots of 1:1 time. The flexibility during the design phase allowed us to layout our split ranch exactly as we wanted. 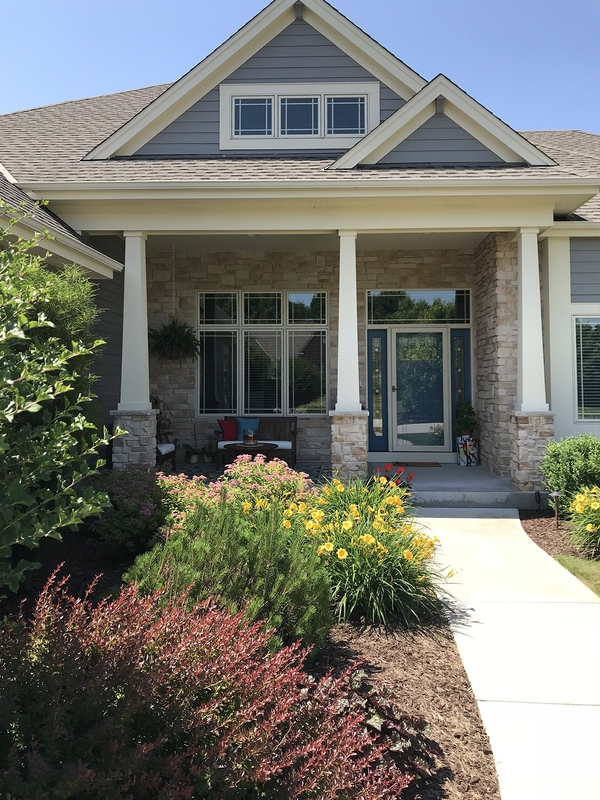 We love the arches, plant shelves, rounded corners, knockdown finish and other “special” design elements that Ware added to customize our home and make it one of a kind. We are very happy with the quality of products that were used for our home and guests can’t stop talking about the beautiful craftsmanship, awesome layout, high ceilings, and tasteful built in’s. 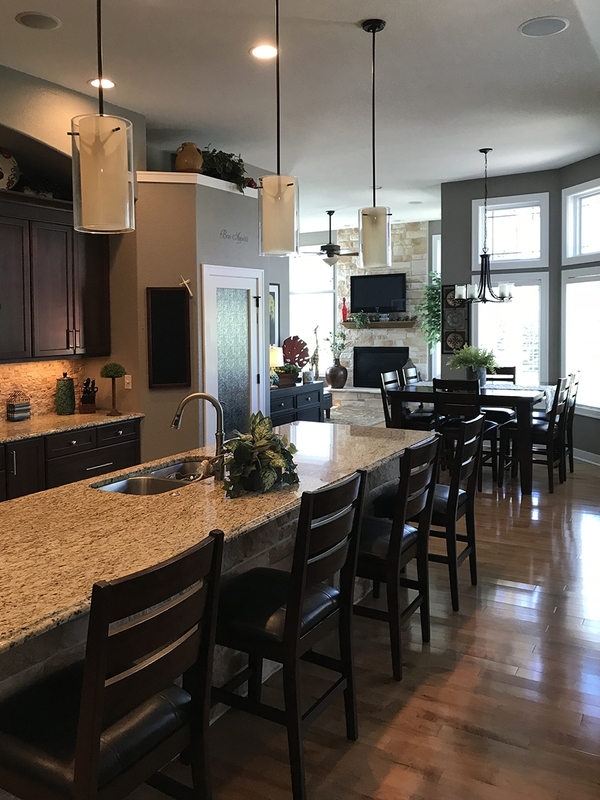 The house is filled with sunlight most days because of the large amount of Pella windows that were added because we specifically asked for an open, bright, and southern exposed home. It was a joy working with the entire Ware team and we would absolutely build with you again!"